Similar to human health, a pet’s digestive, joint, periodontal and other physical and emotional health related issues may be improved with daily added nutrients. 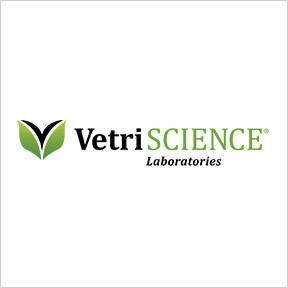 Founded in Vermont in 1972, VetriScience® has one mission: To provide exceptional and innovative nutritional supplements manufactured with proven ingredients and formulated to support the health and wellbeing of companion animals. Commitment to research and new product development allows VetriScience® to offer original science-backed nutritional supplements that complement traditional therapies. In addition, VetriScience® utilizes a Veterinary Review Board assisted by a resident biochemist and a holistic veterinarian. All products are manufactured in the USA under FDA cGMP protocols and National Animal Supplement Council (NASC) regulations. Raw materials are sourced worldwide from high quality suppliers who are required to submit Certificates of Analysis to ensure ingredients have been tested for contaminants, heavy metals, and microorganisms. Further testing for potency, quality, safety and efficacy are conducted by VetriScience® once raw materials specifications are accepted. Most products contain naturally sourced flavorings derived from US sources and processed in USDA inspected facilities. VetriScience® professional veterinary supplements provide core nutrition for preventive care, as well as a more natural approach to maintaining and improving pet health. Canine Plus MultiVitamin Chewable Tablets: This comprehensive multivitamin/mineral supplement provides over 25 nutrients including amino acids, omega-3 fatty acids and antioxidants in support of healthy skin and coat, and proper cardiovascular, cognitive, digestive and nervous system health, as well as overall physical and mental wellbeing. Suitable for dogs of all sizes, ages and breeds. Naturally preserved with mixed tocopherols. Natural duck flavor. Also available in a Senior formula. NuCat MultiVitamin Chews: Formulated for cats of all sizes and ages, this comprehensive well- balanced multivitamin/mineral supplement provides key nutrients for the maintenance of overall physical and mental wellbeing. Twenty five ingredients, including taurine, omega-3s, antioxidants and B vitamins, support immune, eye, brain, heart and bone health, healthy skin and coat, and the maintenance of proper nerve function. Naturally flavored and preserved with mixed tocopherols. Senior formula also available. Composure™: Bite-Sized Chews: Available in both canine and feline formulas, this calming support product is recommended for stressful situations, such as traveling, boarding, moving, grooming, thunderstorms, veterinary visits and more. Specific ingredients help to balance neurotransmitters and support stress reduction and cognitive function. Glyco-Flex for Dogs: Available in several comprehensive formulas to support each stage of life, Glyco-Flex is formulated with New Zealand green-lipped mussels, providing many of the necessary factors for joint, cartilage, tendon, ligament, and synovial fluid maintenance. It is rich in amino acids, polypeptides, fatty acids, naturally chelated minerals, vitamins, protein complexes, RNA and DNA, as well as chondroitin sulfates and hyaluronic acid. Feline formula also available. Hairball: This breakthrough feline formula supports skin tone, elasticity and coat, as well as urinary and GI tract health without the use of laxatives, diuretic herbs or mineral oil. Ingredients include biotin, zinc, essential fatty acids, flaxseed oil and cranberry powder. Natural chicken liver flavor. Naturally preserved with mixed tocopherols. Perio Plus Stix for Dogs: Formulated for daily use between routine veterinary dental cleanings, these tasty and convenient dental heath support chew sticks promote dental cleansing, plaque control and fresh breath, as well as general oral health and gum tissue integrity. Ingredients include spirulina, cinnamon, mushroom extract, cranberry, zinc, taurine and probiotics. Chicken liver flavor is highly palatable to dogs. One package provides 30 sticks.